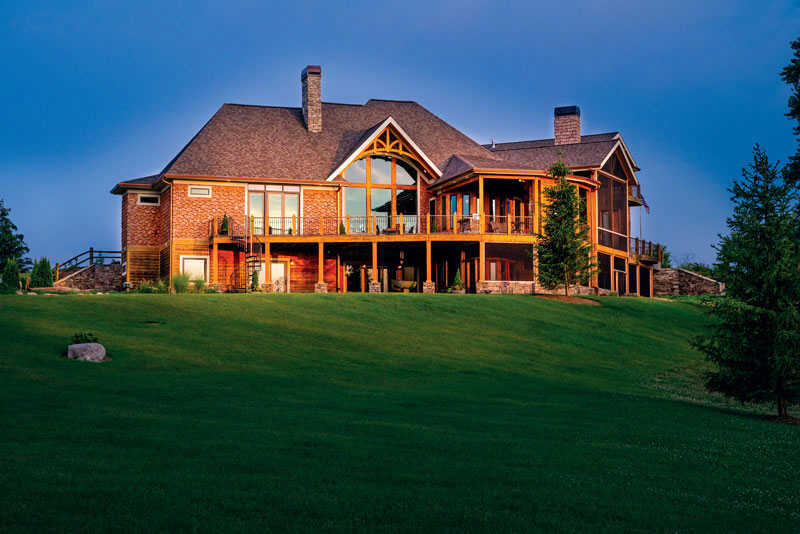 Set atop a hill, the 8,200-square-foot home affords breathtaking views of the pond, meadows and wetlands. A passion for hunting runs in the family, so they’re thrilled with the wildlife that makes regular appearances. 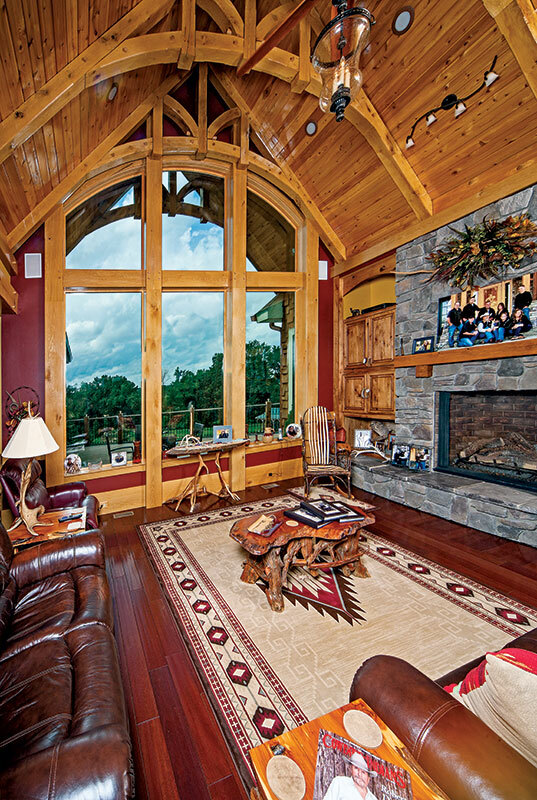 If there’s one thing Dan and Susan Hope wanted to capture in their custom timber home, it was a true pioneer spirit. The reason goes beyond the simple appeal of the style — Dan grew up in a log cabin with many primitive details and his heritage is part Cherokee and part Choctaw, so he yearned for a house that would evoke the spirit of the early days of the American West. Throughout the couple’s show-stopping home, pioneer details abound, from the etching on the front door of an American Indian on horseback (based on the famous “End of the Trail” sculpture by James Earle Fraser) to the traditional, hand-split cedar roof shakes. A bevy of hunting trophies continues the theme; Dan’s passion for hunting is actually what triggered the idea for a rustic home. After buying the land, Dan had a primitive hunting lodge built on the property so that they could enjoy the site while planning their dream house. Rather than rush into a decision, the Hopes spent some time thinking about what type of home would be the best fit. The homeowners spent a lot of time deciding exactly how to site their home on the 90-acre property. “We positioned the house to get the best views from every level and every room,” says Susan. 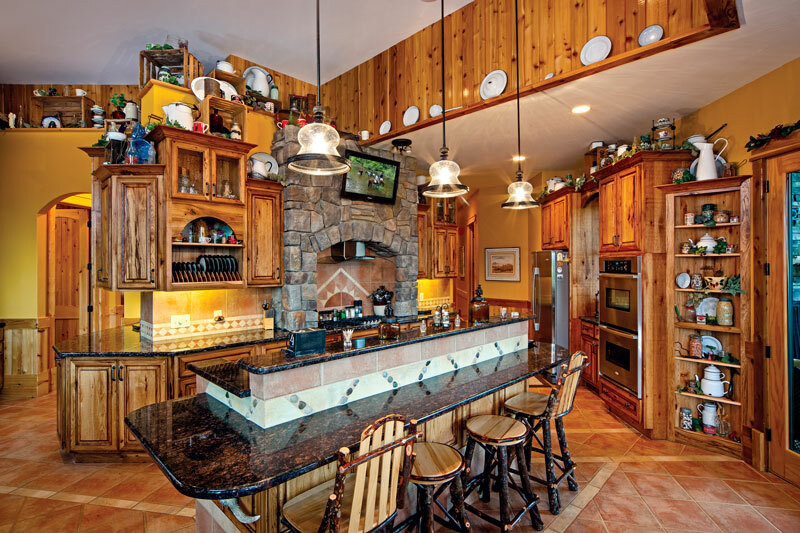 After searching online for a floor plan, the couple found the “Amicalola Cottage” plan from Garrell Associates, which appealed to their desire for a warm and inviting home that was also accommodating and functional. With a few modifications, the plan was ready to go. Siting the home on the property was easy, thanks to an impromptu picnic lunch. “One day, while picnicking on the hill of the property, we realized it was the perfect spot to build the house,” says Susan, noting the panoramic views of meadow and wetlands that the location affords. To make the home a reality, the Hopes turned to general contractor Tom Waterloo of Eagle Crest Homes, who did everything from acquiring grading permits to prepping the roof for shingles. His company also erected the breathtaking oak frame, which was produced by Riverbend Timber Framing in Blissfield, Michigan. The building process was a smooth one, in spite of a rainy spell. The Hopes were very involved in the project; in fact, Dan oversaw much of the construction himself. The result is an 8,200-square-foot home that is a perfect marriage of form and function. The layout features a main level, loft and a walkout basement, offering ample space for visiting friends and family. In fact, there is actually a kitchen of some type on each of the three levels. In addition, there are seven fireplaces within the home (three are exterior). A Southwestern color palette and a bevy of Western collectibles sound a note of old-fashioned charm in the kitchen, while modern appliances and granite countertops add a modern flair. The interior decorating enhances the warm flavor of the home. Filled with Native American artwork and linens, natural wood furniture and a Southwestern color palette, the home captures the Western ambiance that the Hopes were eager to create. A few of the more distinctive features are textured walls, a wood ceiling in the dining room, and a wood/copper ceiling in the breakfast nook, all created by Hertzler Construction of Burr Oak, Michigan. The exterior of the home is just as striking, starting with the roof and its copper-colored gutters. Hand-split cedar shakes were installed in a random pattern, reminiscent of pioneer style. An abundance of outdoor living space — including a 187-degree wraparound deck — offers ample opportunity to enjoy nature at its finest. “From our deck, we see sunrises, sunsets and everything in-between,” gushes Susan. Whether they are walking around the property looking at wildlife or sitting on their deck soaking up the view, the Hopes feel at peace. They have dubbed their home “End of the Trail” after the famous image that graces their front door. Not only does the name reflect the pioneer spirit, it also highlights the simple fact that at the end of the couple’s personal trail each day, an undeniably inviting timber home awaits.